Last year Paul Levy, Matthew Holt and Alexandra Drane asked me to participate in the Engage With Grace Thanksgiving Blog Rally. 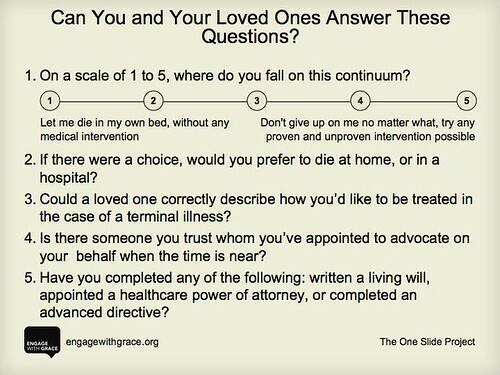 My post last year describes the Engage with Grace project and tells my personal story of why end of life care is important for all of us to discuss with our family and loved ones. 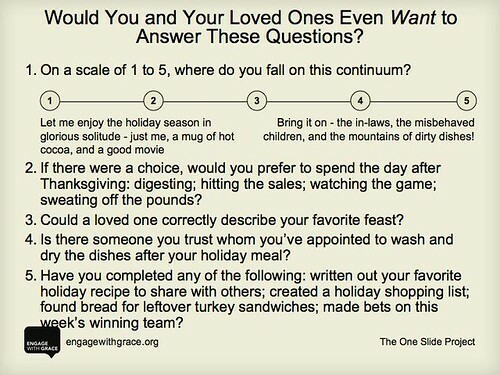 Along with my friends and health blogging colleagues, Paul, Matthew, Alexandra, Adam Bosworth, Christian Sinclair, Drew Rosielle, e-Patient Dave deBronkart, Jessica Lipnack, Ted Eytan and many others - we ask that you to take time to talk to your loved ones over this holiday weekend about these important end of life questions and carry out your wishes by executing a living will and medical power of attorney. How else can you participate in the Engage With Grace Thanksgiving Blog Rally? If you are a blogger, spread the word about the project by adding your own post about Engage With Grace. You can use the text below (download a ready-made html version here) or tell your own story of the importance of communicating your end of life wishes. We suggest you post it starting on Tuesday, November 24 and leave it up over the entire holiday weekend. Today the West Virginia Health Information Network released a Request for Proposal (RFP) for a statewide Health Information Exchange. More information, including the deadlines, bidder worksheets and a full copy of the RFP are available on the WVHIN website. The West Virginia Health Information Network (WVHIN) is soliciting proposals to provide a statewide Health Information Exchange (HIE) infrastructure platform for physicians, hospitals, other health care organizations, and consumers. The purpose of this Request for Proposal (RFP) is to obtain vendor services and expertise in support of the WVHIN. Details on the scope of work, requirements and deliverables are contained in this RFP. WVHIN reserves the right to use the results of this RFP to obtain services for additional and related work should the need arise throughout the course of this project . . .
. . . According to the eHealth Initiative’s Sixth Annual Survey of Health Information Exchange 2009, there are almost 200 self‐reported HIE initiatives across the country with a substantially increased number of organizations that reported being operational. The impetus for HIEs has increased as a result of the passage of the American Recovery and Reinvestment Act (ARRA) of 2009 and specifically key provisions from the Health Information Technology for Economic and Clinical Health (HITECH) Act. These provisions called for the Office of the National Coordinator (ONC) to create a program to engage in collaborative agreements with states or “qualified” state‐designated non‐profit, multistakeholder partnerships to “conduct activities to facilitate and expand the electronic movement and use of health information among organizations according to nationally recognized standards.” . . .
. . . There are 1.8 million people in the very rural state of West Virginia with a high level of elderly and low‐income people in many of the rural areas. With a geographically dispersed population, access to and coordination of care is a critical issue. To serve this rural population, there is a relatively high number of hospitals with less than 100 beds and a high level of clinics serving the underserved making access and care coordination both difficult and essential. Based on the population profile and the number of small providers, a strong case was made for the need for a statewide HIE, which will help providers overcome communication and geographic barriers to access and coordination of care. The WVHIN was established in July 2006 by the West Virginia Legislature at the request of the Governor. The WVHIN is a sub‐agency under the West Virginia Health Care Authority. The intent of the legislation was for the WVHIN “to promote the design, implementation, operation and maintenance of a fully interoperable statewide network to facilitate public and private use of health care information in the state”. With this authority, the WVHIN established a multi‐stakeholder board and has been working with stakeholders to develop and implement a state‐level HIE. . .
. . . With this mandate, the WVHIN established a vision to enable “high quality, patient centered care facilitated by health information technology”. The WVHIN mission is as follows: “The West Virginia Health Information Network provides the health care community a trusted, integrated and seamless electronic structure enabling medical data exchange necessary for high quality, patient‐centered care.” Guiding principles have been established around collaboration, facilitation of patient‐centric care, enabled participation by all providers, quality improvement, patient participation, privacy and security, and sustainability. The WVHIN, along with health systems, physicians, other providers, payers, and consumers, has a unique opportunity to establish a state‐level HIE infrastructure that helps communities and regions share data across organizations. The WVHIN is well positioned to provide a cost‐effective HIE infrastructure that benefits from economies of scale while enabling communities to develop their own unique solutions. As a convener and collaborator, the WVHIN will build bridges between health care stakeholders to launch and fund HIEs. It will help communities address complex issues such as setting standards for interoperable data exchange, addressing liability, setting policies for privacy and security, and exchanging data across state lines. It will collaborate with other health information technology (HIT) and HIE initiatives such as the Regional Extension Center (REC) to be initiated, public health, Medicaid, and others, to leverage collective resources. WVHIN activities are being pursued within the parameters of the West Virginia Statewide Health Information Technology Strategic Plan. WVHIN is one of several participating entities that jointly developed the strategic plan. The Office of the National Coordinator for Health Information Technology (ONC) has launched a second blog called the Health IT Buzz Blog. Just a few weeks ago ONC announced the new Federal Advisory Committee Blog (FACA Blog). The initial post by Dr. David Blumenthal, MD, MPP, National Coordinator for Health Information Technology, talks about the importance of using technology to continue the conversation on Health IT and create a forum for engagement. We intend to address a wide and diverse range of timely topics relevant to the “why’s and how’s” of efforts to support the secure and seamless exchange of electronic health information. We will discuss our ongoing work to protect patient privacy, secure information, and implement standards. We’ll also be using the blog to provide additional information regarding our new grant programs. And the conversation wouldn’t be complete without discussing the meaningful use rulemaking and incentive programs, clarifying our vision and addressing key challenges. We want to hear from citizens, patients, health professionals, managers, policymakers, technology enthusiasts and technology skeptics. We can’t succeed unless we understand the wishes and concerns of the many constituencies we serve. So join us. Tip to @ahier who pointed out the new ONC Blog. Today I participated in the first call of the American Health Lawyers Association's Task Force on Electronic Health Records and Legal Liability. The task force will focus its efforts on the legal liabilities associated with Electronic Health Records (EHR), Health Information Exchanges (HIE) and Personal Health Records (PHR). The group is being led by Jud DeLoss and Kathy Kenyon, both members of AHLA. There was a wealth of health lawyer experience and expertise on the initial conference call. I'm looking forward to helping out on the effort and learning lots from the the task force members on this project. To follow up on Jud's blog post, we would welcome any input that others have on the legal liability issues. My dad told me the following story about the medical record. My dad was a doctor who practiced out of his house on Coffield Ridge in Wetzel County. After my dad died in 1936 our mother sold the household furnishing and his office equipment. I was 12 years old when he died and my older brother was a first year student at West Virginia University. Since my mother wasn't employed she decided to move us to Morgantown where the University was so that my older brother could continue his college education. As a way to continue the family income she rented rooms to college students - many who came to the University from Wetzel County. Included in the sale of the household and office furnishing was a wooden credenza with metal alphabetized slides. Behind some of the slides were some old medical records that were left in the credenza. Thirty years later a lady who was a patient of mine brought the wooden credenza to me and told me that she had bought the credenza at the auction of my family's household items in 1936. She told me that she thought I would appreciate having it. Here are photos of the medical record of a patient from 1934. The medical record format is simple yet complete. It contains all the important demographic and clinical information - including the patient statement, habits, family history, past history, physician examination and diagnosis. On the back is additional space for notes and a drawing of the internal organs that I suspect was meant to be used with the patient for education and instruction. It even has a built in billing record section that even the change:healthcare crowd would love. What can these photos tell us about the current health care reform debate. Compare these photos of a medical record from 1934 to those that cost .73 cents today. Could today's physician and his or her patient get "meaningful use" out of this record? A close up of the billing section for the change:healthcare gang. Below is a visual of the top 500 words used in HR 3962: Affordable Health Care for America Act. Since most people (including many of our representatives in Washington) haven't read all 1,990 pages of the Health Care Reform Bill, I thought a visual aid might be helpful. Click graphic for larger/clearer version. Thanks to Wordle (www.wordle.net) for the cloud. The Office of the National Coordinator for Health Information Technology (ONCHIT) has launched a new blog called the Federal Advisory Committee Blog (FACA Blog). The initial post by Judy Sparrow discusses that the FACA Blog will be uses in a spirit of transparency and collaboration to help open a broader dialogue on the issues before the Health IT Standards Committee and the Health IT Policy Committee. The post also provides some background on the role that Federal Advisory Groups play under the Federal Advisory Committee Act. The second post by Aneesh Chopra, Federal Chief Technology Officer, spells out the planned process for an open conversation that will take place over the next couple of weeks with various committee members blogging about a variety of topics (Proposed Standards, Interoperability, Vocabularies, Privacy, Security, Quality, Implementation Cases Studies). The FACA Blog allows individuals to share public comments on each post and has an RSS feed. Great to see ONCHIT using a blog platform to quickly and efficiently distribute information about the ongoing work being done by the committees to further the health information technology efforts under HITECH. The West Virginia Department of Health and Human Resources (DHHR) unveiled a website for sharing information and updates specific to West Virginia about the H1N1 Flu also known as Swine Flu. The website has information for prevention, schools, businesses, parents and providers. The new West Virginia H1N1 (Swine) Flu Resource Center can be found at www.wvflu.org. The website also has includes a link to the federal Flu.Gov website with national information. Please spread the word about the new website (but don't spread the flu). On October 30, 2009, the Secretary of the Department of Health and Human Services (HHS) issued the HIPAA Administrative Simplification: Enforcement Interim Final Rule, 45 CFR Part 160 (74 Federal Register 56123, October 30, 2009). This new rule was developed and adopted by HHS to conform the enforcement regulations under HIPAA to the revisions made to HIPAA under the Health Information Technology for Economic and Clinical Health Act (HITECH), which was part of the American Recovery and Reinvestment Act of 2009 (ARRA). The rule amends the HIPAA enforcement regulations to include the imposition of tiered ranges for civil money penalty amounts based upon an increasing culpability associated with the violation. A full chart of the violation categories and related amounts can be found in the rule. The interim final rule is effective on November 30, 2009. Comments on the rule can be made prior to December 29, 2009.